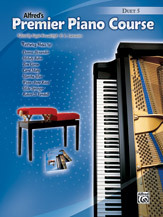 Alfred's Premier Piano Course: Duet Book 5 includes motivational music that reinforces concepts introduced in Lesson Book 5. These duets for one piano, four hands continue the strong pedagogical focus of the course while providing the enjoyment of playing with a friend or family member. Written by America's leading pedagogical composers, these duets contain equally leveled parts for secondo and primo. Within each duet, melodic material is shared between the parts. Styles and forms include a jazz piece, a ballad, showstoppers, a Baroque-style canzonetta, a rumba, and an arrangement of a famous piano sonatina movement. Titles: Canzonetta in E Minor (Dennis Alexander) * Gallop at Midnight (Melody Bober) * Harvest Hayride (Wynn-Anne Rossi) * Jazz Talk (Tom Gerou) * Reaching New Heights (Robert D. Vandall) * Rumba de la noche (Mike Springer) * Sonatina in C Major (Third Movement) (Clementi, Op. 36, No. 1) (Arr. Carol Matz) * Starlight Interlude (Martha Mier).